Remember those “Truck Nuts” that were so popular a while back? Now you can get some for your bike, and they even light up. It takes “grit, wit and huge balls to ride in the city, so show ’em what you got!” says the designers. 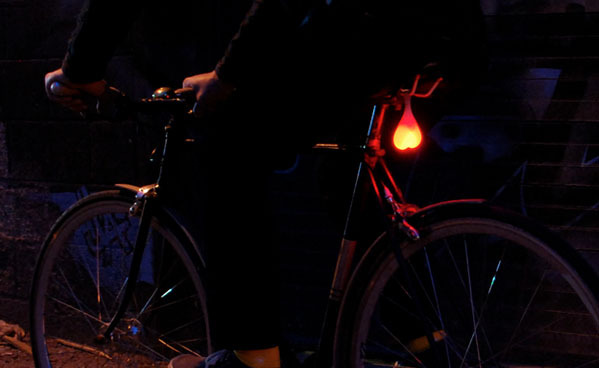 Bike Balls are dropping on a Kickstarter fundraiser that will bring the anatomically “correct” Bike Balls Bike Light to market. The LED light is lovingly cradled inside a squishy silicone sack that can be attached to the saddle rails and allowed to swing freely in the breeze as you ride. This swinging to and fro is more noticeable than a regular bike light, according to the designers. In the case that someone might try and take off with your balls (Don’t you hate when that happens?) you can easily detach the silicone strap and take them with you. 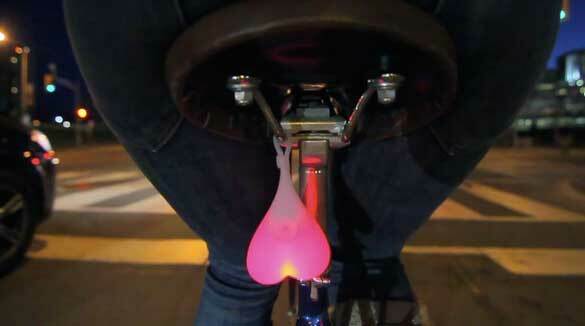 With three modes – two flashing and one steady – the bike balls can be turned on and off by gently squeezing the sack. They are totally waterproof to ensure hours of fun. If it’s finally time to grow a pair, swing over to the Bike Balls Kickstarter page and pick ’em up for just $10! Just make sure you don’t store them in your significant other’s purse.